Is General Motors Planning On Pulling Out Of Canada? In September it surfaced that General Motors Canada plans on closing down one of its Oshawa production lines after 2016, while the future of the second line at the facility was uncertain. 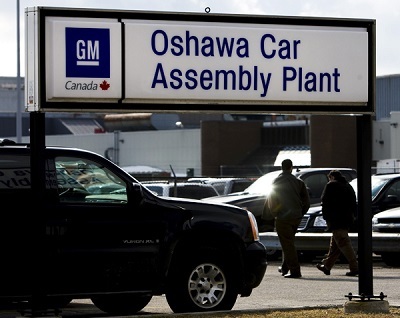 According to the CBC, GM has plans to close down Oshawa’s second line, in addition to drastically cutting back production at its Ingersoll facility, raising questions about the automaker’s future in the country. According to automotive analysts Auto Forecast Solutions, GM will be “all but out of Ontario by 2019,” with the Oshawa plant closing completely, and Ingersoll being reduced to only one shift. GM was obligated to keep 16% of its production in Canada until 2016 in exchange for the $10.8 billion it received from the country during its 2008 bailout, and now has no plans to continue doing so. According to local suppliers, who usually bid on new projects two to four years in advance, they haven’t heard anything from GM in regards to future products. If any new vehicles were planned for Oshawa, there’s a good chance suppliers would have already got wind of it. The automaker hasn’t said if it will close the plant, but with production of the next-generation Camaro moving to Lansing, Mich., the future is looking bleak. The problem is few of the models which GM builds in Canada sell there in great numbers. Toyota and Honda build cars in Canada which are popular with consumers in the country, however GM sells only about seven percent of its Canadian-made vehicles in the country. Canada boasts a skilled, educated workforce, however a high dollar and cheaper labor in Michigan and Mexico makes it a less than ideal place for GM to build cars. Canadian investment analysts say the Canadian government is too slow in making attractive offers to automakers in order to keep their manufacturing operations there. They are urging them to ask GM if they have plans to produce more vehicles there in the future, and to come to a mutual agreement to keep the jobs around if they don’t. Next story Did Cadillac Act ‘Schizophrenic’ With Ad Agency Lowe Campbell Ewald? So where is the next Equinox going to be built? I recall a forum on GMI where it was brought up that there simply isn’t enough capacity at other plants to handle the Nox currently. The Camaro and Impala are going to Michigan and there is capacity at those plants to build them. It’s all too bad really as the Oshawa line has been consistently one of GM’s best over the years according to JD Power and with the Canadian dollar falling its better for export to the USA. Also if anyone is going to read the CBC article please keep in mind that the majority of people who comment on CBC.ca never have anything good to say, regardless of the topic. They do one of two things: 1. blame the federal government for anything bad that happens in the world. 2. Blame private industry for anything that doesn’t fall under #1. The Nox is moving last I saw to Mexico and the Terrain to Tennessee. I think that while the government played a part I suspect that the CAW who has been tougher to negotiate with has played a larger part of the moving of products. GM with the UAW has a lot of plants they can move work to here in the states and Mexico so they shop these new car programs around. It is relatively easier than it used to be moving a line. They offer these new car lines to a local Union and make a deal. If they do not want to agree they simply move it to another plant. GM has too many plants so they have options also many lines anymore can build multiple types and models of cars on one line. This flexibility puts them in a place of power when negotiating. I have not watched the CAW of late but in the last few years GM has not been happy with them. My guess is they burned some bridges here. Oshawa was a good plant but nothing is beyond losing a deal if all criteria is not met. Lordstowns the largest American plant learned it’s lesson and today GM and the UAW work well as they have learned here today gone tomorrow if the unions want to play hardball. I’d hate to bring it up, but Canada did throw in some cash for the bail out too. But it’s all business. Bring on the thumbs down boys. It dosn’t only hurt the CAW it also hurts all the feeder shops. Windsor lost GM transmission, Fords is barely running any engines hear anymore. We got the caravan still but it’s threatened to be taken away at any moment. It’s a shame really, we pushed out some damn good products if you ask me. Camaro’s, Challengers, and even the old trusty Cown Vic’s. It’s a shame, but if the Canadians buy Toyota’s and Honda’s, instead of GM products… What’s the company supposed to do? The Canadian buying public has made its choice, and therefore GM has responded. Its called loyalty. In Michigan, GM products are everywhere. GM products are everywhere in Canada too, just maybe not the RWD Camaro’s. Ontario makes great products, but you have to pay for it. (It’s called quality) Unfortunately Ontario’s tax and electricity are through the roof. But yet Chryslers can make the Caravan here and sell it at a price Honda or Toyota cain’t touch. And them pulling out because Canadians aren’t buying there cars has to be a very small deciding factor. Windsor has probably the biggest GM following in Canada, but yet they closed our plant years ago. I’m in Michigan on a regular basis and I can tell you that I see a ton of imports there BTW.